Heat oven to 350 degrees F. Line a 13x9-inch baking dish with foil; coat foil with cooking spray. To make the crust, in a large mixing bowl, using a mixer on medium speed, beat cream cheese until creamy. Beat in butter until well combined and creamy. Beat in confectioners' sugar and salt until combined. Beat in flour until just combined. Pat dough into bottom of baking dish to form a crust. Bake 15-20 minutes or until light golden brown around edges. Melt butter in a large saucepan over medium heat; cook about 2-3 minutes, whisking frequently, until butter browns ands starts to foam. Stir in pecans and cook 2 minutes, stirring frequently. Remove pan from heat. In a large mixing bowl, whisk together eggs until combined. Whisk in brown sugar, corn syrup, bourbon, vanilla and salt until well combined. Whisk in melted chocolate until combined. Stir in pecans until combined. Pour filling onto crust. Bake 20 minutes or until golden brown and set. Cool completly on a wire rack before lifting out foil from dish and slicing into bars. I can't remember the yield. I believe it made about 20 bars. 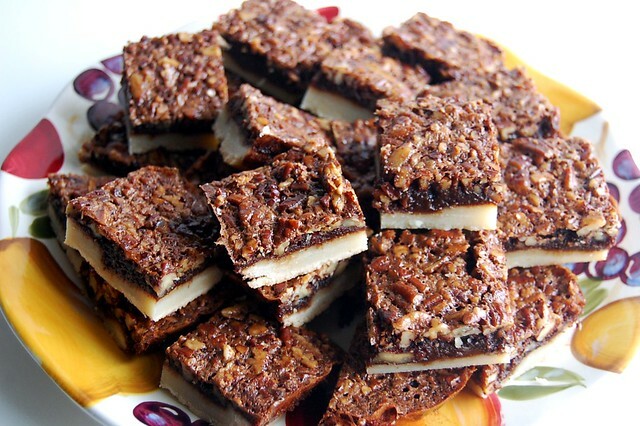 41 comments on "Bourbon Chocolate Pecan Pie Bars"
Looks delicious...I love your recipes!!! Looks like everyone had such a great time. I love the idea of sweet potato and marshmallows; although I can't even imagine what it would taste like! As for your peacan pie bars....I'm drooling? Seriously, they look so perfect for this festive/Christmas season. Um bourbon plus pecan pie plus chocolate? And in bar form so we can eat lots and lots of them? Delicious! I really really like these bars! Chocolate, bourbon, pecans, wow! I love your list of things you are thankful for. And I am thankful for your blog! You and Eric always look so happy together--and that just adds to your already lovely food. Bourbon and chocolate! Two of my favorite things in the world! I must make these while I wait for the revealing of your mystery dessert! I'm thankful for your desserts. I'm thinking I have to make these bars soon! Glad you had a great holiday. Wow those bars look absolutely sinful. And the rest of your meal looks awesome, too. Happy belated Thanksgiving! Those pecan pie bars look amazing. I am wondering if the mystery dessert is either some kind of brown sugar pie or some kind of brown sugar-topped cheesecake. Either way it looks beautiful, and I feel full just looking at all of that. Pecan pue in just a few bites would be perfect Emily. Glad you had a memorable Thanksgiving. There is so much to be thankful for. Looks like you had a great Thanksgiving! I love your pictures, they're so clear! I really have to get a new camera.. but anyway those look really good(: Can't wait to see what mystery dessert you made! 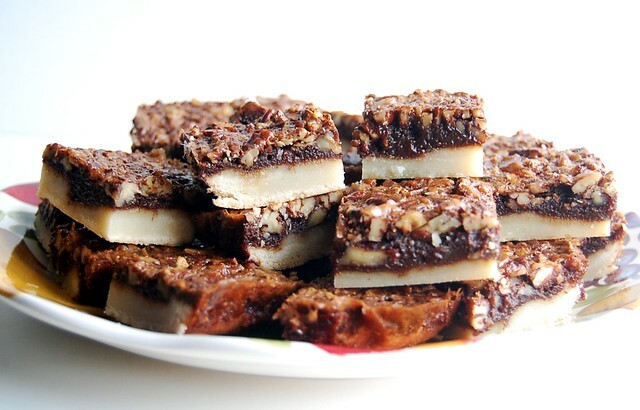 I've never even had pecan pie, but I think I'll skip right to chocolate pecan pie and make these bars. Oh, and I can't get enough Little Debbie Christmas tree cakes! I'm curious about the mystery cake! The bars look great--I made a chocolate maple pecan pie this year and everyone really enjoyed the chunks of chocolate. Chocolate makes them all happy! 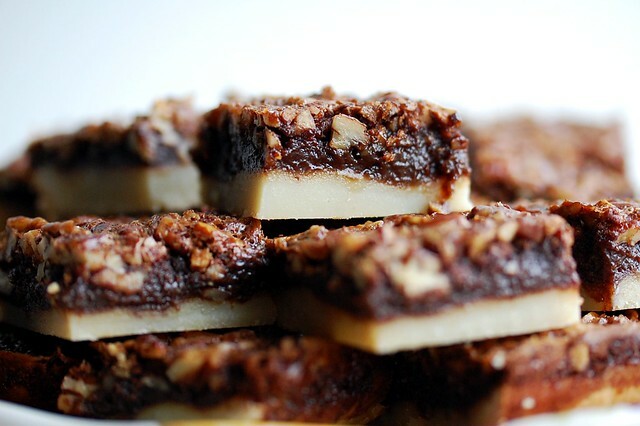 ohh i love pecan bars, and the bourbon and chocolate sounds amazing! i made pecan bars recently with maple syrup and they were to die for. i'm really interested to see what your mystery dessert is! Don't know you. Never seen your blog before. But you are a doll! 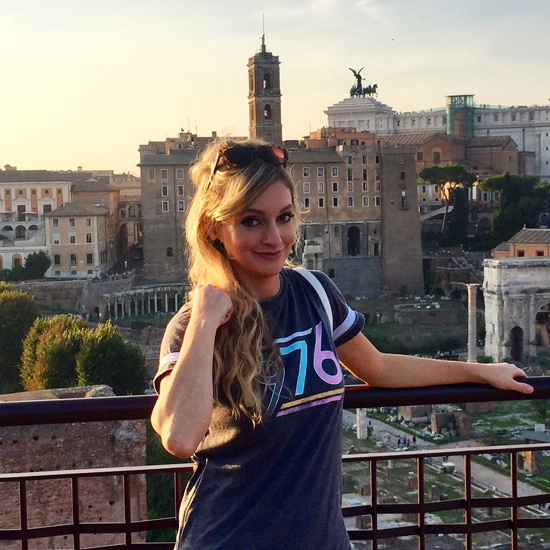 You're so cute and I loved-loved-loved your sort of wandering dialogue blog. It had serious amounts of charm! you had a beautiful spread and that pecan pie bars looks like the perfect ending to that spread! I am such a pecan pie addict that I know I would adore these pecan pie bars! Especially since I didn't get my pecan pie fix this year. Delicious! You are inspiring as usual! A pie in a bar :D yum! And what a thanksgiving dinner. It seems so much more exciting than a British christmas dinner. Those rolls.....drool! Snickerdoodle cheesecake! That's my guess for the mystery dessert? Can I win one if I'm right?! Glad to hear it was a delicious one! how could you be sick of those rolls?? they look drool worthy!!! ooh, those look amazing, as does you entire FEAST! i'm having a hard tiem thinking about xmas cookies! My son loves Little Debbie's Christmas Tree cakes! The pecan pie bars look delicious but that sweet potato casserole looks like it's something to die for....do you have a recipe for it? I would love to make it!!!! Looks like good food and good folks. My favorite thing is sweet potatoes, too. I like a streusel topping, but mallows are good, too. I can not wait for the recipe to that cake! It looks like a buttermilk cinnamon sugar cake or something! GAH! Your family and bf are so cute, I am glad you had a lovely holiday! Seriously y'all know how to throw down some Thanksgiving -- that is awesome. I'm so happy to read that your brother-in-law is doing well. What a blessing for your family. Your Eric is just the cutest -- you make a precious couple. Thanks for sharing your day. The crust on those bars sounds really interesting. i know i'm a little late, but i am glad you had such a good thanksgiving. loved all the pics! such good news about your bro-in-law! Wow! Everything looks sooo great. Your mother needs a vacation in Tahiti, I think. And how great that everyone is well and TOGETHER! That's what Thanksgiving is all about. that sounds AMAZING! omg i'm totally going to try these out! glad you had such a great thanksgiving! AHH! I made the exact same corn casserole recipe in the exact same dish (from Walmart?)! I agree, it was super easy and pretty good! Wow, thanks for sharing your Thanksgiving with us. I had such fun reading this and looking at the photos. And I was also bowled over by the title of this post - how could anything with a name like that not be out of this world fantastic??? And I thought chocolate bourbon pecan pie was good...these bars look outstanding girlfriend!!!! Your family looks so fun and happy! 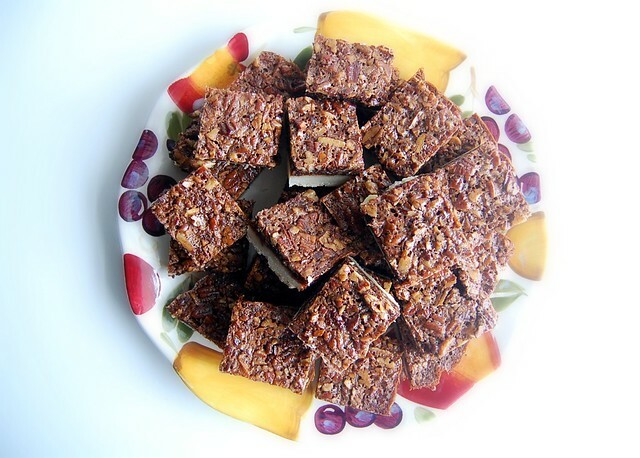 All of the food looks delish - and I have GOT to try your chocolate pecan bars - ASAP! Sounds like a lovely day! And any dessert with bourbon in it is a-ok in my book. This place is full of beautiful people, especially the staff New Orleans Bar & grill.